It’s been a remarkable season so far. We’ve been experiencing serious summer weather for weeks now with decent amounts of rain every now and then. There are no better growing conditions. The vineyards are three weeks (!) before the average schedule and we’re expecting harvest to kick in late August. Most vineyards carry a lot of grapes, big grapes. We normally don’t have to but this year we are removing grapes at this point to avoid the yields being too massive. It was the beginning of June when green pruning had already finished and we started managing the jungle. Having such a big & well working crew this season we could afford removing some of the lower leaves early on. The Pinots are always particularly nasty as the shoots don’t hold on to their positions. … the top section of the bat vineyard with the richer soil the green is going bonkers. It’s sometimes cumbersome getting through and but higher plants have deeper roots helping loosen up the soil. What that power-growth whether was enormously good for: our baby vineyard. Besides the Pinot Noir (which is just a few dozen plants) pretty much everything is growing very decently. Even in the mid section of the hill where the soil is most poor and dry. What’s left? 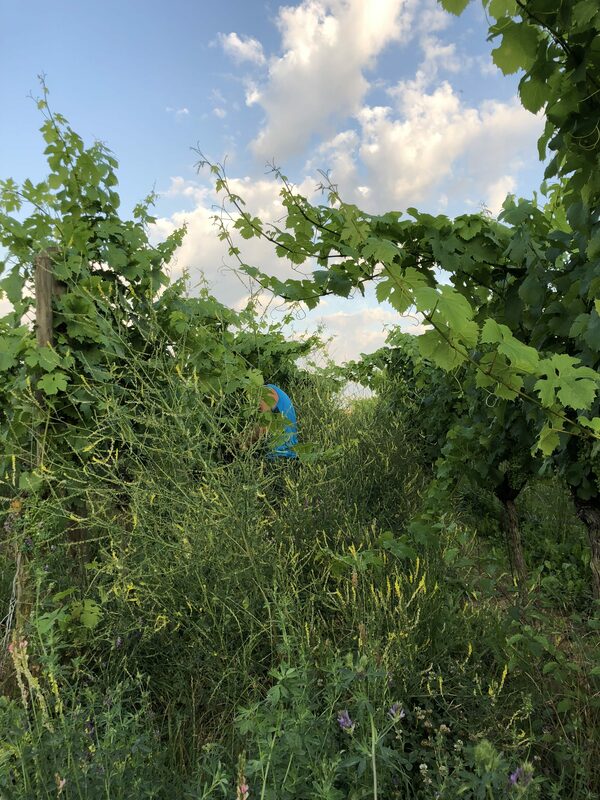 The Regent and the Schwarzriesling have to get their lower leaves removed, we have a bottling week coming up with the new Black Betty, Kleine Wanderlust, red Fledermaus, Drei Freunde and the 2016 Wilde Heimat. And the rest will be harvest preparation. I can’t believe we’re already that close!